It’s raining… Google Pandas, Penguins, and other SERP animals. So what’s the latest change in the Google forecast of updates? Starting this past month, Google started to list “how to” lists and directions on SERPs. There are many different types of results that can pop up based on the queries, featuring extensive how-to information that will help users better find what they’re looking for, quickly. How Does The How-To List Work? This screenshot was taken from the top of SERPS. On the surface, it looks fairly harmless, right? It’s informative, enticing, gives enough to get you started yet leaves enough out that you are practically required to click on the link in order to see what else there is to see. Most “how to” queries are so specific, as well, that it seems like the perfect thing to do to really give your site some exposure. It also helps that lists are appealing to many people all over the Internet because they represent order and contain concise information in a place where information comes at us from all sides constantly. But as appealing as it may look, just how great is this new enhancement in the Google search algorithm? Is it really an enhancement? Is it truly useful or is it just a nuisance? Did you know? “How to” queries are one of the most popular queries on Google. Appealing to all the age demographics that are dominant online – Millennials, Gen X, and Gen Y – they can reveal a great deal of information in a single encapsulated text that takes the user step by step through virtually anything he or she requires. From cooking recipes like the pork tenderloin recipe above to changing the oil to even learning how to tie your shoes, lists are powerful things that anybody can understand. It would behoove a website to feature at least one “how to” list of some sort on their website because it can allow the user to find out for themselves if they can do whatever it is they are searching for. But the new Google SERPs are hardly perfect. In fact, one could say that there are some glaring issues which devalue the pages and make the how to lists rather irrelevant. Let’s look at the cons and the pros here. Con: Lack of Variety. Just look at the example up top once again. You see some directions which tempt the user into clicking on the link. But what if that is not the recipe they want? What if they want their pork tenderloin to be simpler than that, with just succulent white pig and breading without all the extras? That result is the only result listed on the entire SERP that is available in a snippet form like that. All the others are just traditional links with a brief description about what is behind that simple blue text. No directions, nothing to entice the user to click on the link. They are almost moot. And yet, the SERP is giving us that one single option as if it is the one recipe for pork tenderloin ever invented. How do they decide that this link is deserving of the window while all the others are not? See, this is the biggest problem with the new “how to” snippets on Google. They act like this link is the authority on how to cook tenderloin without much consideration for other recipes. The spectrum in how to cook something is so wide that it’s virtually impossible to say that this particular recipe is the best of the lot. The programmers themselves admit in their essay about the snippets, Cooking with Semantics, that “action interpretation also depends on situational context.” In other words, things change based on the situation. Even the power of Google cannot determine precisely how somebody wants something done; therefore, they cannot determine how to do something precisely the right way. Humans are a chaotic and hugely individual species. How one person does something may not necessarily apply to his neighbor. It’s part of the challenge and beauty of the human experience. Con: Style Inconsistency. The inconsistency of the results is particularly jarring. Google doesn’t use the same standards across the whole field. 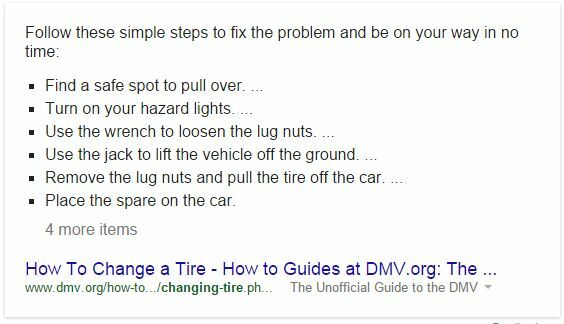 Check out this snippet Google gave me when I searched for how to change a flat tire. See how much more information is present in this snippet in comparison to the other one? Also note the lack of prose within the pork tenderloin snippet. The styles are not the same, not even remotely. Con: What’s the Deal With For-Profit Pages Only, Google? There is one more detail that is fairly troubling. For most “how to” queries and the subsequent SERP showing the information the user wants, the sole snippet does not come from a nonprofit website like WikiHow. It’s almost always a for-profit page. This means that Google is not necessarily responsible for determining which link gets the direction snippet. They are paid for the special attention. This article really reveals the depth of Google’s “subscribed snippet” program which was a part of the engine for quite some time before it was replaced by the “rich snippet” program which gives greater prevalence to bigger websites and companies. While I cannot be sure if the same type of program is going on with the direction snippets, the evidence that it is, is like a white elephant. What’s The Pro? A Possible Guide For New Users. Now, one could also argue that “how to” lists are perfectly acceptable as a guide for first-time users. This much is very true and leads one to conclude that this is most likely the target demographic for users. User intent is especially important when it comes to listing search results and most people who would enter a “how to” query are searching for information they do not have access to at the moment. When it comes to interpreting the value of these results, we have to keep that in consideration, and the short of it is that these types of results are invaluable as introductions to the world the user is entering. I can tell you, I certainly don’t know how to cook pork tenderloin, and this result is giving me a reason to try it out. Are there problems with the Google direction snippets? Oh yes. The program definitely needs some work. But I do think that there will come a time when they will become valuable as a source of information. Until that time, though, maybe it’s best to just avoid putting “how to” lists on your website.